Community Servings is a free, home‐delivery meals program for the acutely ill, their families and their caregivers throughout Massachusetts who are battling 35 types of illnesses including HIV/ AIDS, Cancer, Lupus, Diabetes and MS. Since 1989, Community Servings’ founding goals are to help clients maintain their health and dignity, provide nutritionally and culturally appropriate meals, preserve the integrity of their family… and send the message that someone cares. Each pie we sell provides one week of healthy meals to a person in need. Please consider purchasing a Thanksgiving pie ($25) in support of Community Servings. You can visit my personal donation page for more information and to place an order. 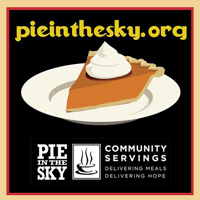 Click here to download more information about Pie In The Sky. Big Foot Moving & Storage, Inc. is a fully licensed and insured Massachusetts based moving and storage company. We are a Small Business conveniently located 10 minutes outside of Boston in Arlington, Massachusetts. We offer solutions for moving, storage, receivership, truck rentals and international shipping. Big Foot Moving & Storage, Inc. is on the board and are long-standing members of the Massachusetts Movers Association, and have attained the ProMover status from the American Moving & Storage Association (AMSA). Big Foot Moving & Storage, Inc. is your complete packing, moving, and storage solution provider. Please visit our website at www.bigfootmoving.com or contact us at (781) 488-3090 for a quote or for additional information. Click here to download this press release. Arlington, MA – December 12, 2011 Thanks to the generous support of family, friends, colleagues, and clients, Team Pie It Forward sold 921 pies and raised $32,351 for the “Pie in the Sky” annual bake sale held by Community Servings. Mike Bavuso, President of Big Foot Moving & Storage, Inc., sold 395 pies and raised $10,381.00 alone. From late October to several days before Thanksgiving, “Pie In The Sky” raised a record-breaking total over $565,000 with 16,000 pies sold by hundreds of volunteers. Proud to be the #1 Pie-Selling Team for 2011 and 2012, Pie It Forward members include: Mike Bavuso, Tamela Roche, Caitlin Healy, Adam Goncalves, Gabriella Innella, Walker Christie, Karen Coleman, Merel Corstius, Juan Murray, Kathy Wentworth, Joseph Aceto, Brian Jurgens, Stella Murray, Patrick Dwyer, Jenette Jurgens, Mary Dean McKee, Rich McKee. 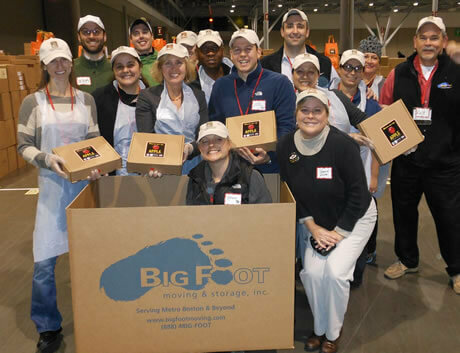 Team Pie It Forward joined hundreds of volunteers to box pies at Pie Central and Big Foot Moving & Storage, Inc. donated two days of moving services to deliver thousands of pies. The Big Foot Moving & Storage, Inc. crew made deliveries to pick-up locations in greater Boston. Some of our pie clients include ARIAD Pharmaceuticals Inc., Davidson Management, Cambridge Offset Printing, Meadhall, Leader Bank, The Appraisers Group, Advance Auto Center, Sirois Electric, Patriot Financial Group, Barkan Management at One First Condominiums, and Porcini’s. Since 1990, Community Servings is a free, home-delivered meals program for the acutely ill, their families, and their caregivers throughout 200 square miles of Massachusetts battling 35 types of illnesses which include HIV/AIDS, Cancer, Lupus, MS and Diabetes. The founding goals of Community Servings are to help clients maintain health and dignity; to provide nutritionally and culturally appropriate meals; to preserve the integrity of their family… and send the message that someone cares. Today, one of our trucks was stopped for a routine vehicle inspection while delivering a military personnel shipment to the Hanscom Air Force Base. The security forces at the gate detected some materials on the exterior of a lift van that they felt required additional investigation causing a temporary closure of the Vanderberg Route 2A Gate and an evacuation of nearby facilities. Big Foot Moving & Storage employees and company personnel complied with all request of state, federal and military authorities managing the inspection and investigation. Our vehicle and personnel have been cleared and we are thankful that the incident has been resolved. We assure our customers that we take this matter very seriously. The safety of our crew, customers and their goods is of utmost importance to us. We thank all the authorities and military personnel for their thoroughness and their commitment to protecting our country every day. Award reflects company’s consistently high level of customer service. Big Foot Moving & Storage, Inc. has earned the service industry’s coveted Angie’s List Super Service Award, reflecting an exemplary year of service provided to members of the local services marketplace and consumer review site in 2014. Since 2009, this is Big Foot’s 6th consecutive year of winning the award. Big Foot Moving & Storage, Inc. is a full service moving and storage company based in metro Boston, providing local and long distance services for residential, commercial, and government customers. President & CEO, Mike Bavuso, expressed his gratitude for this award, “We aim to provide exceptional customer service so it has been an honor to be recognized since 2009 with the Angie’s List Super Service Award because it is based on true feedback from the consumer. We understand the stress involved in moving and we do our best to build relationships with our clients”. About Big Foot Moving & Storage, Inc.
December 29, 2014 – Big Foot Moving & Storage, Inc. announces its achievement of the American Moving & Storage Association’s Enterprise Award for Small Movers 2014. The company is recognized for exemplary work in consumer and community benefits, employee benefits, industry contributions through innovation, an enhanced industry image, overcoming challenges by altering operations and practices, developing an unique and successful approach to conducting business, and business practices that address social and economic issues. New offerings and innovations contribute to the attainment of the Enterprise Award for Small Movers and overall company success. Big Foot Moving & Storage is a Penske Truck Agent so it may offer customers a greater array of services. Additionally Big Foot Moving & Storage secured a GSA schedule, which allows it to perform Federal office relocations and expand its scope as an independent mover. Technology plays a key role in improving operational efficiency and accessibility for its customers. The sales team is equipped with iPads for all estimates so they may generate specific surveys during site walkthroughs. Also, customers may choose to pay their bills securely via credit card on Big Foot movers’ company issued smartphones. The leadership at Big Foot Moving & Storage is committed to its people and realizes the importance of work-life balance. It offers a great benefits program including subsidized gym memberships, flexible schedules for students, and awards and recognitions. Big Foot is passionate about fostering a winning team; one that is loyal, respectful, and fun. As such, employees enjoy the passionate sports town of Boston with Celtics tickets throughout the season. The organization’s environmental commitment includes a fleet of late model trucks using Diesel Exhaust Fluid (DEF) to reduce emissions. Reusable plastic crates are utilized on all office relocations to ensure a seamless transition for the business, as well as a reduction in waste for the environment. 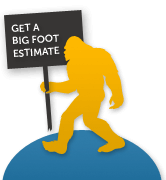 Big Foot offers customers gently used moving boxes if they are interested in a more environmentally responsible relocation. Big Foot Moving & Storage will return to the job site, free of charge, after its customers are unpacked to collect boxes for future use. Big Foot Moving & Storage takes pride in its community and strives to give back whenever possible. It partners with the Arlington MA Food Pantry by donating time and equipment to transport 15,000 lbs of food on a monthly basis. Mike Bavuso, Big Foot President and CEO, and other team members fundraise for the not-for-profit Community Servings, an organization that prepares and delivers meals to individuals and families who are homebound with life threatening illnesses. On a continuous basis, Big Foot donates office supplies, furniture, and household goods to local schools, non-profit groups, and others in need in the area. Furthermore, it donates labor, trucking, and storage to local community groups such the Zonta Club, The Children’s Room, Arlington Youth Baseball & Softball Association, and Arthritis Foundation. The American Moving & Storage Association (AMSA) is a nonprofit national association for the full-service, professional moving and storage industry. It has more than 4,000 member companies across the United States and internationally. Its mission is to represent the interest of its members while educating and helping customers understand the value of professional moving services. Big Foot Moving & Storage, Inc. has again earned the service industry’s coveted Angie’s List Super Service Award, reflecting an exemplary year of service provided to members of the consumer review service in 2013. Since 2009, this is Big Foot’s 5th consecutive year of winning the award. Service company ratings are updated daily on Angie’s List. Companies are graded on an A through F scale in areas ranging from price to professionalism to punctuality. 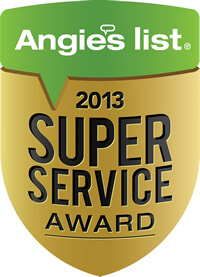 Members can find the 2013 Super Service Award logo next to company names in search results on AngiesList.com. Fact: More than 727,000 people in the state of Massachusetts are living on incomes that put them at risk of hunger each year. Thirty-six percent of those at risk are children. With times getting tighter these numbers are dramatically increasing. Thousands in our community need your help. As you are aware, many people throw out a good deal of “stuff” when they move. Unfortunately a lot of this “stuff” is food that can be delivered to a family in need. That’s why Big Foot Moving & Storage, Inc. has teamed up with Move For Hunger to support the Arlington Food Pantry. Please set aside any unwanted, non-perishable food items before your move and Big Foot Moving & Storage, Inc. will deliver the food to the Arlington Food Pantry. Move For Hunger is a non-profit organization that works with the relocation industry to support the efforts of local food banks. Your donations will directly impact families living right here in Massachusetts. Big Foot Moving & Storage, Inc. is grateful for your business and truly thankful for your generosity. Click here to download a copy of this announcement in .pdf format. Last week, Big Foot Moving & Storage donated moving and storage services to The Children’s Room (TCR) for their renovation project. The Children’s Room will be refurbishing the garage and cellar areas and utilize the space as the garden level. After the completed renovations, the Big Foot team will then relocate the TCR staff to new garden level offices. This move to the new space will create a much needed additional program and training space within the facility. The project will be completed by the end of the summer. The Children’s Room is the largest independent, non-profit organization in Massachusetts dedicated to creating safe, supportive communities so that no child, teen or family has to grieve alone. Learn more about TCR, who they are, and how you can be a part of our unique community, please visit http://childrensroom.org/about. 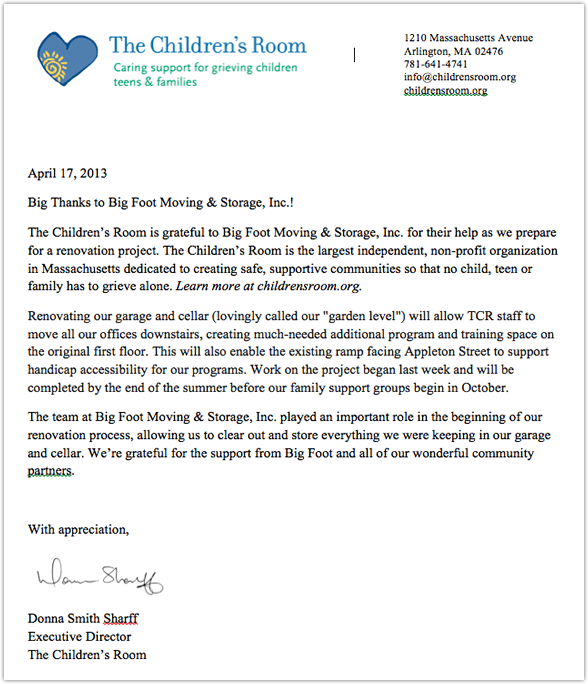 Big Foot Moving & Storage, Inc. is proud to offer assistance to The Children’s Room as they continue to help grieving children, teens, and families in our communities to go on living fully. Thanks to the generous support of family, friends, colleagues, and clients, Team Pie It Forward sold 921 pies and raised $25,645 for the “Pie in the Sky” annual bake sale held by Community Servings. Mike Bavuso, President of Big Foot Moving & Storage, Inc., sold 338 pies and raised $9,410.00 alone. From late October to several days before Thanksgiving, “Pie In The Sky” raised a record-breaking total over $538,000 with 15,000 pies sold by hundreds of volunteers. Proud to be the #1 Pie-Selling Team for 2011, Pie It Forward members include: Mike Bavuso, Tamela Roche, Karen Coleman, Patrick Dwyer, Kathy Wentworth, Brian Jurgens, Margaret Kelley, Brooke Kavoogian, Joseph Aceto, Janet Picinich, and Walker Christie.